By Karen Katz It's Hanukkah, and Baby wants to spin the dreidel -- but where is it? Lift the flaps to find sparkly foil Hanukkah gifts, and join Baby in this fun-filled hide-and-seek adventure. A wonderful Hanukkah treat for babies! The author of Counting Kisses and Where Is Baby's Belly Button? brings her recognizable characters to this Hanukkah story. Where Is Baby's Dreidel? features large faces with sturdy lift-the-flaps that encourage children to "search" for the missing dreidel. Foil illustrations help add to the appeal. A sure hit for babies and toddlers! By Naomi Howland Sadie and her four brothers are not looking forward to Chanukah; they are poor, and there is nothing to eat. Sadie goes out to collect firewood but takes pity on an old woman and gives her the wood. In return, the woman gives Sadie a magic frying pan. It will cook as many potato latkes (pancakes) as the family wants until Sadie utters the magic words that make it stop. The pan works fine while Sophie cooks, but when she leaves, the boys try--with predictable results. Latkes fill the house, then the streets, until Sadie arrives home to say the magic words. By that time, there are more than enough latkes for the whole village to feast. Howland effectively sets her story in a Russian shtetl, using words, intonation, and especially pictures. Working in gouache and colored pencil, she offers a snowy landscape peopled with Jewish villagers who work hard and celebrate harder. Especially nice is the overview of the villagers on the last night of Chanukah men and women whirling under the stars eating all those latkes. This excellent book retells the fairy tale of "The Magic Porridge Pot" with a Russian-Jewish family. When Sadie gives an old woman all the firewood she has collected, the woman repays her by giving her a magic frying pan. Sadie must say "Latkes, Latkes Good to Eat ..." and the pan fills up with hot oil and delicious latkes. When Sadie is finished, she must say "A Great Miracle Happened There". One day when Sadie goes out to the woods, her brothers say the magic words to turn on the frying pan but can't quite get the phrase right to get the pan to stop, resulting in quite a mess. Howland's prose and beautifully detailed illustrations help make this book a new family classic. Also includes a short description of the story of Chanukah and a recipe for the latkes Sadie would have made if she didn't have her magic frying pan. For more stories based on the same original fairy tale, look for The Full Belly Bowl, The Magic Porridge Pot, or Moishe's Miracle. 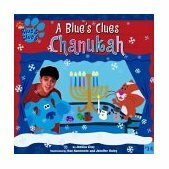 By Jessica Lissy Blue has been invited to a Chanukah party at Orange Kitten's house. Young fans can join Blue and her friends as they celebrate family and explore traditional holiday activities. Blue, Joe, and their friends have been invited to a Chanukah party at Orange Kitten's house. They help make menorahs, light Chanukah candles, make latkes, and play dreidel together. The conversational style of the book is similar to the Blue's Clues TV show and the bright illustrations will engage fans of the show. An excellent story for introducing the traditions of Chanukah to a Jewish or non-Jewish audience. VHS Video Also Available It's Chanukah, that special time of year, and Chuckie, Angelica, and Tommy are ready to see Grandpa Boris in the annual pageant. But there's more action going on backstage, with excitement that has even grouchy Schlomo getting into the spirit of things. And soon everybody, even the youngest, is ready to light the menorah and usher in the holiday. Includes a separate telling of the story of Chanukah. When Grandpa Boris and the "Meanie of Chanukah" put on a Chanukah Play, the Rugrats gang shifts into high gear to save the day. This humorous story is based on the Rugrats' Chanukah Special and frequently has the nonstop-action feel of an episode of the Rugrats TV show. The story itself assumes that readers are familar with the story of Chanukah, so parents or teachers may want to read the Story of Chanukah postscript before reading this to a non-Jewish audience. This book will be an absolute hit with Rugrats fans everywhere! By Diane Levin Rauchwerger When a loveable, mayhem-causing dinosaur arrives to help a small boy celebrate Hanukkah, he brings chaos in his wake. Whether lighting candles, making latkes, eating chocolate Hanukkah gelt, or playing dreidel, the boy gets more than he bargains for as his dinosaur buddy eagerly joins in. Children will eagerly devour the adventures of the newest character to celebrate the Jewish holidays in the tradition of The Cat in the Hat. A boy describes how a dinosaur came to visit and celebrated Hanukkah ... with a little bit of chaos to spare. The dinosaur's antics will be sure to delight readers of all ages. Recommended for toddler and preschool readers. Children will delight in this interactive Hanukkah book. Small light bulbs enable readers to "turn on" the book from the cover and gradually reveal one more light on the menorah. Short simple rhymes describe how a family celebrates each night of Hanukkah. They sing songs, play dreidel, eat latkes and sufganiyot (donuts). Each nights highlight, however, is adding one more candle the menorah. An excellent choice for toddlers and preschoolers. Children will love learning about Hanukkah in this dreidel-shaped alphabet book! Every page contains a letter of the alphabet along with sweet, rhyming text and words that correspond with that letter. And as an added bonus, at the end of the book is the complete story of Hanukkah! This is a fantastic introduction to the holiday! The celebration of Hanukkah is highlighted by each letter of the alphabet in this wonderful storybook. Each letter's treatment involved a short four-line rhyme explaining the term. While most of the terms are specific towards Hanukkah, some of the terms are more generally Jewish (i.e., "Israel", "Rabbi"). The bright illustrations reflect a modern Jewish family's joyous celebrations. Overall, an excellent book for children learning the alphabet and for those reading alound together. By Arthur Yorinks Hungry from the lack of appetizers (Mother doesn't believe in them) one Chanukah, Uncle Izzy and Uncle Shecky start arguing over what kind of car cut them off recently, a Buick or a Ford. Shecky shakes a pickle so hard it bounces off Izzy's forehead, and the food fight is on. Borscht, chicken, sour cream, even the chocolate Chanukah gelt--nothing is sacred. But when one last latke soars out the window, it just keeps flying! Soon news reporters and FBI agents are swarming the house, seeking the source of the mysterious UFO. The family is stranded in the house, with almost no food, until everything blows over. In Arthur Yorinks's fantastically wacky version of the traditional Chanukah story, the remaining plate of latkes, which, in that crowd, should have lasted "about seven and a half minutes," lasts for eight days! An all-star (or mostly-star) cast of actors and illustrators were "cast" for this unusual book, staged and photographed by Yorinks and Paul Colin. Newbery- and Caldecott-award winning illustrator William Steig (Sylvester and the Magic Pebble) provided the background art, as Yorinks and Colin digitally transferred photos of the posed actors into the illustrations. This hilarious take on the Jewish holiday, while wildly offbeat, remains true to the spirit of the Chanukah miracle; ultimately, the fighting stops and forgiveness reigns. In what is probably the most original Hanukkah children's book currently in print, Arthur Yorinks takes a different spin on the holiday story. While waiting for dinner to be served, Uncle Izzy and Uncle Shecky get into a disagreement about whether they were cut off by a Ford or a Buick. In the midst of the resulting argument, a latke gets thrown out the window but never comes down. The latke soon attracts the attention of the news media and the FBI. The family is forced to remain inside, living on no thing but latkes, until the brouhaha calms down. In a twist on the traditional Hanukkah story, a plate of latkes that should have lasted about seven-and-a-half minutes lasted for eight days. This hilarious story features hand-drawn backdrops with photos superimposed on them. The hilarious poses of the actors and the subtle changes in the background (look for the shifty eyes on the portrait) will keep kids hooked even on the 20th reading. This book will be a hit with children and their parents alike! By Sylvia A. Rouss Sammy Spider returns for another adventure with the Shapiro family. Each night, the Shapiros light a new candle and give Josh a new dreidel to spin. Sammy wants to play, but he is told, "Spiders don't spin dreidels. Spiders spin webs." By the eighth night, Sammy gets his own special Hanukkah surprise. Like all the books in the Sammy Spider series, Sammy Spider's First Hanukkah teaches a concept in addition to the Jewish holiday. In this case, colors and numbers are emphasized. With each night, a new candle is added, and Josh receives a dreidel with a new color. A growing collection of multicolored dreidels sits on the right side of the page to help reinforce both the counting and color concepts. Children will delight in the continuing saga of their friend Sammy Spider! By Sylvia A. Rouss An activity book chock full of rhymes, with mazes, matching, dot-to-dot, pages to color and more! The best Hanukkah present for Sammy Spider fans. By Alexandra Cooper Celebrate Chanukah and play the dreidel game! Spin the dreidel and see where it lands. Nun, gimel, hey, and shin -- who will win? Give it a spin! This unique board book features an actual spinning dreidel in its spine. Short rhymes tell children the 'rules' of the dreidel game: take all the coins with gimel, end your turn with nun, take half with hey, put coins in with shin. Children will love to spin the dreidel as each letter is explained. This interactive book is highly recommended for preschoolers and toddlers. By Eric A. Kimmel Folkmeister Eric Kimmel pays a visit to Chelm at Hanukkah time, accompanied by illustrator Mordicai Gerstein. Together they serve up a delicious pastiche of eight tales, one for each night, about that foolish realm. The towns' denizens boast names like Simon and Esther Goose, Stupid Shmelke and Berel Dunce. Gerstein outfits the zany citizens with colanders and fry pans for hats, neckwear of three bananas, a necklace of bagels, and footwear ranging from lilac roller skates to cross-eyed mouse moccasins. Although nonsense abounds, Kimmel's sure sense of the potential of wisdom even among the most foolish brings sweetness and lightness to these tales: here in Chelm, community reigns, and these silly folk treat one another with loyalty and kindness. In a variant of "Stone Soup," a stranger's "magic" spoon yields delicious latkes for all as the stranger asks for a pinch of salt, a handful of meal, eggs, onion, and potatoes from the eager citizens. If they are duped when the stranger lends Chelm the spoon for cash collateral and never returns, they are duped together. Kimmel alerts us in an author's note to the mixture of his collection: a dollop of retellings of traditional Yiddish tales, a soup -- on of reworkings from other cultures, blended with three original stories. The last tale, a Kimmel creation, brings all the stories together, pronouncing the great joy of celebration in Chelm where the people light a hayfork menorah, make latkes from nothing, spin letterless dreidels, and "dance night and day to music that they alone can hear." According to legend, when God created the world, he intended to spread all the foolish souls throughout the world. Unfortunately, there was an accident, and all the foolish souls landed in the lone town of Chelm. What is unfortunate for the residents of Chelm is a delight to children learning about their troubles. In this collection, Kimmel tells of the antics of the fools of Chelm as they try to celebrate Hanukkah. He tells why their dreidels have no letters, how a simple errand to pick up some chicken fat can lead to quite a different item coming home, and how the fools of Chelm are able to use a magic spoon to make latkes from nothing (with a few extra ingredients added). Each story is short enough to make a delightful storytelling time after lighting the candles. What are the poor villagers to do? The holiday-hating, hill-dwelling hobgoblins are bound and determined to ruin yet another Hanukkah for them. Every year the beasties snuff out the menorah candles, destroy the dreidels, and pitch the potato latkes on the floor. But these wicked wet blankets never counted on someone as clever as Hershel of Ostropol showing up. Using his wits and a few props--pickles, eggs, and a dreidel--Hershel manages to outwit all the creepy critters and break the spell. This fabulously creative adaptation of the ancient Hanukkah story in which the Syrians forbade the Jews to worship as they wanted, keeps the spirit of the original while adding a spine-tingling twist. Warmth and humor prevail, even in the midst of hopeless-looking circumstances. Award-winning illustrator Trina Schart Hyman creates lively and witty pictures that pair perfectly with Eric Kimmel's words to create this Caldecott Honor Book. Eric Kimmel's story originally written for Cricket magazine is now available in a stand-alone picture book. Hershel of Ostropol arrives at the next village eager to begin the celebration of the first night of Hanukkah. What he finds is a town where people are afraid to celebrate because of a group of goblins that have taken over the old synagogue preventing any holiday celebrations. The only way to rid the town of the goblins (and reclaim Hanukkah) is to light the candles each night in the synagogue and have the King of the Goblins light the candles on the last night. Hershel cleverly manages to outwit the goblins and reclaim Hanukkah for the village. Hershel and the Hanukkah Goblins is an excellent book for reading alound and will eagerly capture a child's imagination. A brief description of the history and modern customs of Hanukkah is included in the epilogue. By Stephanie Spinner Every night of Hanukkah, after Owen - the Official Candle Lighter - lights the menorah, Grandma Karen kicks off her cowboy boots and tells him a bedtime story. On the first night there's the inspiring story of a girl who dreams of becoming a rabbi. On the fourth night there's the amazing story of the alien who gets lost in a little girl's backyard. And on the seventh night there's the silly story about a boy who wants to be a baby - and whose parents let him! Join Owen in discovering how each of these stories is also a celebration of his own heritage in this heartwarming book about faith, family, and the miracle of Hanukkah. Owen is named the family's official Hanukkah candle lighter, and along with every candle comes a story. Grandma Karen tells about a girl who grows up to be a rabbi; a soldier who persuaded Jewish families to pray for the health of his wife; a young woman who earned enough money to buy her own horse. Spinner drops subtle hints (perhaps too subtle for the audience) that the characters in the stories are members of Owen's family, but by the end of celebration the links become clear--though no one is saying if the alien creature in one story is also part of the family. With seven stories to tell, the text is long, but the inclusion of the alien piece is a nice break from family lore, and familial warmth helps diffuse the sometimes rather earnest tales. Gouache paintings in framed borders further lighten the mood. Such whimsical pictures as a young Grandma riding into the sky on her horse and clever design elements help integrate the bedtime stories with Owen's happy Hanukkah. This year, Owen has been selected to be the O.C.L., the Official Candle Lighter. Every night, after he lights the candles, Grandma Karen tells him a story, each sounding suspiciously like a member of the family. On the final night, the entire family gathers to hear Grandma Karen tell a story about a boy who did a great job as the O.C.L. that he got to do it every year. The fanciful illustrations add to the storytelling fun. An excellent story to encourage families to discuss their own histories. By Nancy E. Krulik "Is it Hanukkah yet?" This addition to the superb "Step into Reading" series focuses on the Jewish holiday of Hanukkah. In this book, a young girl eagerly awaits the first night of Hanukkah. She helps her mother prepare for the start of the holiday but is told "Not yet. We have to wait for the sun to set." Her grandparents arrive, but she is still told to wait until the sun sets. Finally, her father arrives home as the sun sets, and the holiday can begin. The menorah is lit, the family plays dreidel and sing songs, and everyone eats latkes for dinner. At the end of the evening, the narrator happily concludes that she gets to do it all again tomorrow. Krulik captures the excitement and anticipation that young children feel towards Hanukkah and the warmth of a family celebrating it. This Level 2 book uses basic vocabulary, short sentences, and simple stories to enable early elementary school children to read with help. A pronunciation guide is provided in the beginning to help with some of the more difficult Hanukkah-specific words. By Latifa Berry Kropf Vibrant full-color photos show students lighting the menorah, playing dreidel, and telling the story of Judah Maccabee when they invite their grandparents to a Hanukkah party. Preschoolers invite their grandparents to a Hanukkah party and celebrate by lighting the menorah, playing dreidel, making sufganiyot, and telling the story of the Maccabees. Includes facts about Hanukkah and a recipe for sufganiyot. Photographs of preschoolers preparing for a Hanukkah party and their celebration with their honored guests (their grandparents) highlight this delightful Hanukkah book. The text is simple and conversational. The photographs are of an actual preschool class and the authenticity won't be lost on readers who will relate to the subjects in the pictures. The book includes a description of Hanukkah and a recipe for the sufganiyot (doughnuts) that is prepared by the students in the book. An excellent pick for preschool-aged children. By Joan Holub Hanukkah is here! There are so many fun things to do-light candles in the menorah, open presents, eat latkes and chocolate coins, play the dreidel game, and more. With the turn of each page, another candle is added to the menorah and another fun element of Hanukkah is depicted. Children can lift the flaps and see all the special ways there are to celebrate this joyful holiday. Holub focuses on four siblings' preparations and celebrations of Hanukkah. Each night of Hanukkah brings on a description of a different aspect of wintertime and the Jewish holiday. The bright cartoonish illustrations are simple enough not to be overwhelming, yet are detailed enough to allow children to find something new every time. The flaps are quite sturdy and should be able to stand the test of time with most preschoolers. A wonderful read-aloud book for toddlers and preschoolers. By Betty Schwartz Where can Max's dreidel be? As he searches his home, Max joins his family as they prepare for Hanukkah. By story's end, everyone -- including Max -- has what he needs to enjoy Hanukkah dinner. A young boy searches through the sturdy pages of this lift-the-flap book for his lost dreidel. While he does not find his lost toy, he does see his family members all polishing, and otherwise readying different traditional Hanukkah treasures of their own. For young readers unfamiliar with the holiday, this interactive introduction will be informative, as well as entertaining to read. For young readers who have grown up with Hanukkah customs, the fun here will be in guessing what's under each flap. Readers who like their endings happy will be pleased to know that while our young hero really doesn't find his lost dreidel; he does get a new one from his grandma! While his family prepares for the start of Hanukkah, Max is determined to find his missing dreidel. This wonderful lift-the-flap book uses sturdy flaps to allow readers to help Max look throughout his house. The book encourages readers to guess what is under each flap by completing several sentences only under the flaps. ("Would you like to try one of my tasty potato ... latkes?"). An excellent book for children to read-aloud during the holiday of Hanuakkah. By Myra Shostak "Rainbow Candles, I see ONE Hanukkah has just begun." An eight-night Hanukkah counting rhyme for preschoolers. Colorful,laminated board book. A new board book from a publisher known for excellence in concept as well as execution is always a treat. Simple rhymes count the colored candles, and each night's Hanukkah treat piles up on the floor with the others till, at the end, there is a full menorah and a full floor. The primary colors are bright, the little girl is precious, and the book is a winner. This board book is popular with all the children I read it to and it's easy to see why. The rhymes are simple and fun, the illustration feaure an adorable little girl, and the numbers encourage children to read along. An excellent book for toddlers and preschoolers. By Beth L Blair and Jennifer A Ericsson Kids love holidays, especially Hanukkah, which is celebrated for eight dazzling nights. From the lighting of the menorah to the blessings and all the tradition in between, kids are mesmerized by the magic of this celebration. 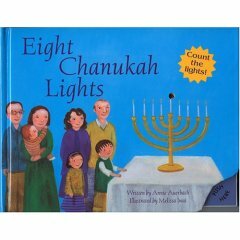 With this book, kids will enjoy more than 100 puzzles and activities about: the history of Hanukkah from its roots more than 2,000 years ago; the meaning behind the various rituals, traditions, and prayers; why certain foods are eaten during Hanukkah; Hanukkah crafts, decorations, and gifts they can make; and more! Kids will enjoy watching this fun-filled puzzle and activity book unfold, as each chapter opens with one more candle lit on the menorah. With this book by their side, kids are sure to become dreidle-spinning masters in no time! Just when kids get to the age when they become cynical about anything educational, along comes the "Everything" series to tackle Hanukkah for kids. This book features a plethora of puzzles, activities, and brain teasers to keep kids entertained for hours!